This cake is basically St. Louis Gooey Butter Cake topped with Bananas Foster Sauce, making an already good thing even better. Stir the milk and yeast together in a small bowl and set aside for about 5 minutes to allow the yeast to come alive. Alternate adding the flour and yeast mixture: 1/3 of the flour, 1/2 of the milk, 1/3 of the flour, 1/2 of the milk, 1/3 of the flour. Beat each addition on medium speed for about 30 seconds, until thoroughly combined. Scrape down the sides of the bowl after each addition. After the last bit of flour has been added, beat the dough for about 1 minute, until the texture is very smooth. Press the dough into an even layer in an ungreased 9×13 baking dish. Cover with plastic wrap and let sit at room temperature until it’s risen slightly, 3-4 hours. When the dough has risen, preheat the oven to 350 degrees and prepare the topping. Add the honey, water and vanilla to a small bowl and stir to combine. Add the butter, both sugars and salt to the bowl of a standing mixer fitted with the paddle attachment and beat on medium high speed until very light and fluffy, about 5 minutes. Add the egg and beat for another minute to combine. Alternate adding the flour and honey mixture: 1/3 of the flour, 1/2 of the honey, 1/3 of the flour, 1/2 of the honey, 1/3 of the flour. Beat on low speed after each addition just long enough to combine ingredients. Be careful to not over beat. Spoon dollops of the topping across the cake and then use a spatula to smooth into an even layer. Be gentle – you don’t want to press the air out of the risen dough. Bake for 30-35 minutes. The cake is done when the surface is a rich golden brown and the edges are set, but the center is still very jiggly. Don’t worry – the center will set as it cools. Add the butter, brown sugar, cinnamon, nutmeg and salt to a medium sized heavy bottomed sauce pan. Cook over medium heat until the butter and sugar melt and boil, about 5 minutes. Stir in the cream and continue to cook, stirring constantly, until the mixture comes to a full boil. Turn the heat down to medium-low and continue to cook, stirring constantly, for 5 minutes. Add the bananas, stir to coat and bring back to a boil. Stir in the rum and cook for another 2 minutes, stirring gently to not mash the bananas. Pour the sauce into a bowl and serve immediately. You can also store this bananas foster sauce for 2-3 days in the refrigerator. Let cool completely at room temperature before covering tightly and storing it in the refrigerator. Before serving, heat slowly in the microwave for 20-30 seconds. Cut the cake into squares or rectangles. 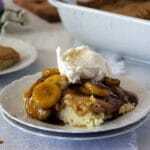 Serve each slice with a few spoonfuls of warm bananas foster sauce and a scoop of vanilla ice cream.